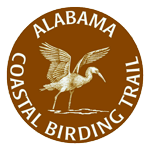 South Baldwin County Loop. This loop begins at the intersection of AL 59 and US 98 in Foley. It is an inland route featuring sites offering an interesting mix of habitats and providing great opportunities to see a diversity of species. This section is not really a loop but several excursions off of AL 59. Bon Secour Bay is found on the eastern edge of Mobile Bay and provides a protected area for wintering waterfowl and seabirds. Scan the bay and the small canal for gulls and tern. Black-crowned Night-herons may be found roosting in the oaks scattered through the area. County Road 95 Park/Arnica Bay is a small public access point maintained by the county. Various species of wintering waterfowl may be seen. Also look for Brown-headed Nuthatch in the surrounding pines. Graham Creek Nature Preserve is a 484 acre natural area managed by the City of Foley. In addition to protecting a portion of the Wolf Bay watershed, this preserve also possesses open pine forest with extensive wire grass and pitcher plant bogs. The combination of habitats is attractive to a diversity of bird species including Northern Bobwhite,, Red-tailed Hawk, Loggerhead Shrike, Yellow-throated Vireo, Pine Warbler, Prairie Warbler, Summer Tanager, Blue Grosbeak and several species of waders along the creek. Magnolia Springs Landfill is a county landfill–ninety-nine percent of the gulls utilizing the landfill in winter are comprised of Laughing, Ring-billed, and Herring Gulls, but rarities like Franklin’s, Thayer’s, Iceland, Lesser Black-backed, and Glaucous Gulls are all additional possibilities. American Pipits (winter), Fish Crows and both vultures are also regular. In January 2009, a Snow Bunting was seen, accounting for the first state record. Mullet Point County Park provides an excellent view of the bay from an elevated perspective. This has been a good site in the winter for waterfowl. Surf and Black Scoters have been seen here in the cold weather months.There is ample parking, portable restrooms and picnic facilities.